Subject: Implementation of Government’s decisions on the recommendations of the 7th Pay Commission-Revision of Pension of pre-2016 pensioners/family pensioners etc- Procedural actions for revision. 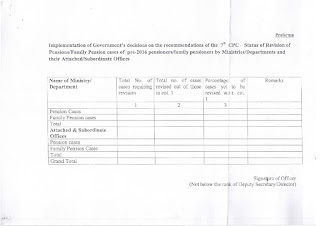 The undersigned is directed to say that orders for revision of pension of pro-2016 pensioners/family pensioners by notional pay fixation in the 7th Central Pay Commission Matrix have been issued vide this Department’s O.M. No.38/37/2016-P&PW(A) dated 12.05.2017 Subsequently, concordance tables for fixation of revised pay and pension/family pension of pre-2016 pensioners/family pensioners have also been circulated vide this Department's O.M. No. 38/37/2016-P&PW(A) dated 06.07.2017. Inspite of clear Govt. orders to revise pensions of old retirees, many offices have not yet started the process, saying they do not know of any such orders. When will the lethargic babudom awake in building new India and who will awake them? /practice of making delay in this computer age also and later to claim extra remuneration for this work, as if they are spending more time for this work. One Modi is not enough to mend them. 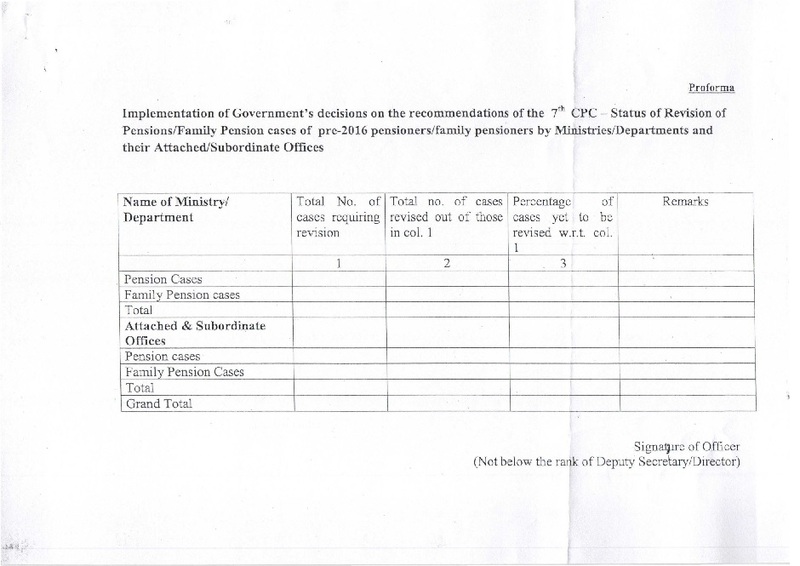 To implement option 1 of 7th cpc for pensioners they said about 'feasibility of getting records'!!!!! Now the modified formulation is very clear (based on LPD) Now they want take time on the pensioners to submit application with pension details along with some irrelevant info & each department prescribe different type of application form and not a common one soliciting the required details and some unscrupulous elements make money by selling this application from alone, from the gullible old pensioners.!!!!! Only a few of the erstwhile Wholetime NCC (REgular) officers are alive;all of them have retired and quite a few of them have expired.The remaining are in the last years of their lives as they are all near about 80yrs or above.It is learnt that these officers are clubbed with MNS officers for pension purposes,for best known to the authorities concerned ,though during their service they have been performing same duties as the regular offisers of the 3 forces posted to NCC.These officers have not been considered for re- fixing their pension as per the normsof'one rank one pension'nor refixing their pension for full pension irrespective of completing 33 years of service nor revising their pension being falling under the category of 'pre 2016 retirees'! we are a few in numbers and all in the twilight years of their lives.There is no one to take up their casefor getting their dues from the government.I for one have decided to send an an application as per RTI Act seeking information/action on these matters.